What’s it about? Holliday Grainger and Emile Hirsch star as the titular duo in a miniseries that follows Clyde from little boy through meeting Bonnie to the beginning and end of their crime spree. It originally aired simultaneously on The History Channel, A&E and Lifetime in the US. It’s the story everybody knows. Clyde is a petty criminal who meets Bonnie at her wedding (and in his visions before this) and soon teams up with Bonnie, both romantically and criminally, to carry out a series of bank jobs and robberies. She yearns to be a star, even giving posed photographs to the press to accompany stories of their misdemeanours. The supporting cast includes two Oscar-winners in Holly Hunter as Emma Parker, Bonnie’s mother, and William Hurt as a sheriff drawn back from retirement to catch the pair. Verdict: The character of Bonnie Parker steals the show (and lots of money) thanks to Grainger’s fantastic performance. She brilliantly shows Parker with her flirtatious Southern drawl, and appetite for fame. Hirsch doesn’t steal the scenes quite so much, but he gives a solid performance. He’s not as charismatic as Warren Beatty, but is probably slightly closer to the real-life figure. This version focuses on the love story between the pair, and tries harder to be historically accurate than the iconic 1967 Arthur Penn film, but this doesn’t make it a more entertaining account of events. It must be said that the whole miniseries (which is all put together as one feature on the DVD) is beautifully shot, with stylish costumes, vivid colours and grand sets. It’s a lot brighter in palette than other programmes and films set in the same era, such as Boardwalk Empire or Road to Perdition. This isn’t to say that it has a rose-tinted view of events. It doesn’t shy away from showing people getting shot and killed, or Clyde getting raped. If it wasn’t sticking to a 15-certificate, this programme may have been more exciting to watch. One of the less successful elements are Clyde’s premonitions. Called ‘the sight’, these provide compelling images, but perhaps take some of the momentum – and credibility – out of the show. Momentum is a major issue. With a 240-minute runtime, you would expect it to go into far more depth of character than the 1967 film did, but if anything the characters that emerge here are blander. Throughout the programme there are sporadic slow motion sequences, such as dancing or gunfire, accompanied by music. This effect really doesn’t add much to proceedings, though the mix of music from the time and a more traditional score is fairly effective overall. The film is 111 minutes long, so it has to be asked whether we gain a huge amount from this new version which is over double the length. The answer to this would have to be a resounding ‘no’, but in fairness that is in part due to just how great and impactful the original was. Though an enjoyable enough watch, this miniseries does feel a little bland, and spells things out to the audience in a way that feels a little patronizing at times. There are times when something happens and we see Barrow’s premonition again, just to remind us he had it. Perhaps with more episodes this might have been needed, at a push, but it feels completely unnecessary as a single feature. There are also times where the dialogue feels a little convenient or unrealistic, such as Bonnie cutting out their names from a newspaper and liking the ring ‘Bonnie and Clyde’ has to it over ‘Clyde and Bonnie’. Maybe this did happen in real life, but there has to be a more interesting way to portray it. All-in-all, it’s a fairly formulaic affair. Extras: The extra features aren’t all that revelatory. There’s a short piece about the making of the film, which does give some nice behind-the-scenes information on how they pulled off some of the technical scenes in the film, notably the climax. There are also short videos on ‘Becoming’ Bonnie and Clyde, but these don’t provide much of interest, other than hearing Holliday Granger’s native English accent. Grainger certainly emerges from this better than anyone. She really is ‘one to watch’ – to use the cliché. 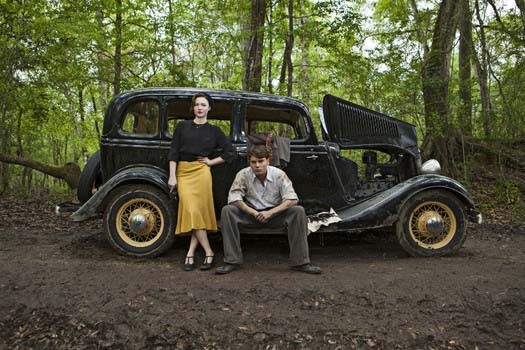 It would have been nice to have perhaps a documentary or more detail on the real-life events of Bonnie and Clyde, and some explanation of the things changed in the miniseries, especially considering the History Channel were involved in its production. Final words: Bonnie and Clyde is a very well put together miniseries full of beautiful shots, stylish costumes and decent action. Though it certainly doesn’t break any new ground, the performances are good, especially Holliday Grainger who completely steals the show as Bonnie. The premonitions take away from it being a more realistic version of events than the 1967 film, which means it’s completely caught in the middle: if you want a fun, fictionalised account of the events, watch the 1967 film. If you want the real events, watch a documentary. Bonnie & Clyde is out now on DVD with UltraViolet.